Who should not take Tegretol Tablet? Take this medication by mouth with food as directed by your doctor. What conditions does Tegretol Tablet treat? Tell your doctor right away if you have any serious side effects, including: headaches that are severe or don't go away, signs of liver problems (such as nausea/vomiting that doesn't stop, loss of appetite, stomach/abdominal pain, yellowing eyes/skin, dark urine), signs of kidney problems (such as change in the amount of urine), mouth sores, fainting, fast/slow/irregular heartbeat, unusual eye movements (nystagmus), vision changes (such as blurred vision), joint pain, swelling of the ankles/feet, pain/redness/swelling of the arms or legs, numbness/tingling of the hands/feet, signs of low levels of sodium in the blood (such as extreme drowsiness, mental/mood changes including confusion, seizures). List Tegretol Tablet side effects by likelihood and severity. Before taking carbamazepine, tell your doctor or pharmacist if you are allergic to it; or to other anti-seizure medications (such as phenobarbital, phenytoin) or tricyclic antidepressants (such as amitriptyline, desipramine); or if you have any other allergies. This product may contain inactive ingredients, which can cause allergic reactions or other problems. Talk to your pharmacist for more details. Before using this medication, tell your doctor or pharmacist your medical history, especially of: decreased bone marrow function (bone marrow depression), blood disorders (such as porphyria, anemia), glaucoma, heart disease (such as coronary artery disease, heart failure, irregular heartbeat), kidney disease, liver disease, mental/mood disorders (such as depression), mineral imbalances (such as low levels of sodium or calcium in the blood ). What should I know regarding pregnancy, nursing and administering Tegretol Tablet to children or the elderly? Some products that may interact with this drug include: certain azole antifungals (isavuconazonium, voriconazole), orlistat. Does Tegretol Tablet interact with other medications? Should I avoid certain foods while taking Tegretol Tablet? 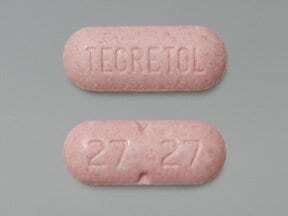 This medicine is a pink, oblong, partially scored, tablet imprinted with "TEGRETOL" and "27 27". Are you taking Tegretol Tablet? Are you considering switching to Tegretol Tablet? How long have you been taking Tegretol Tablet?